Despite the tremendous destruction wrought by catastrophes, social science holds few quantitative assessments of explanations for the rate of recovery. This article illuminates four factors—damage, population density, human capital, and economic capital—that are thought to explain the variation in the pace of population recovery following disaster; it also explores the popular but relatively untested factor of social capital. Using time-series, cross-sectional models and propensity score matching, it tests these approaches using new data from the rebuilding of 39 neighborhoods in Tokyo after its 1923 earthquake. 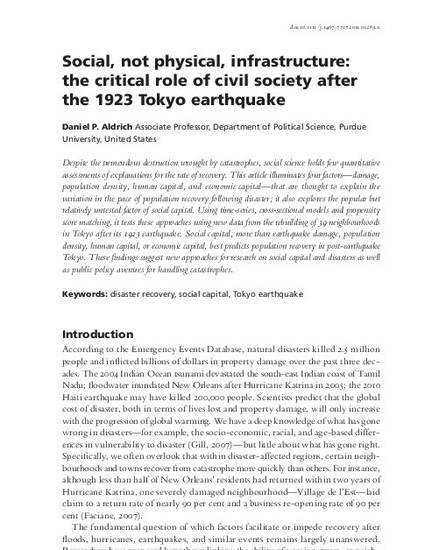 Social capital, more than earthquake damage, population density, human capital, or economic capital, best predicts population recovery in post-earthquake Tokyo. These findings suggest new approaches for research on social capital and disasters as well as public policy avenues for handling catastrophes.